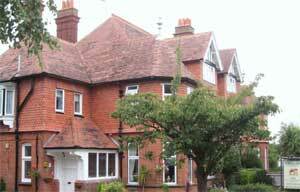 The Temple Lodge is located at 2 Queens Road in Brockenhurst. Check room availability using the search box on your right. Highly rated, with awards for cleanliness and hospitality, this family run Victorian guest house is set in beautiful gardens and opposite the open forest. Recently redecorated throughout, all rooms are en-suite, spacious and well appointed with mini fridges. Excellent freshly cooked breakfasts using local produce. Only a few minutes walk to the village and local amenities. Private car park. Ideal base for exploring the New Forest and the Hampshire coast.